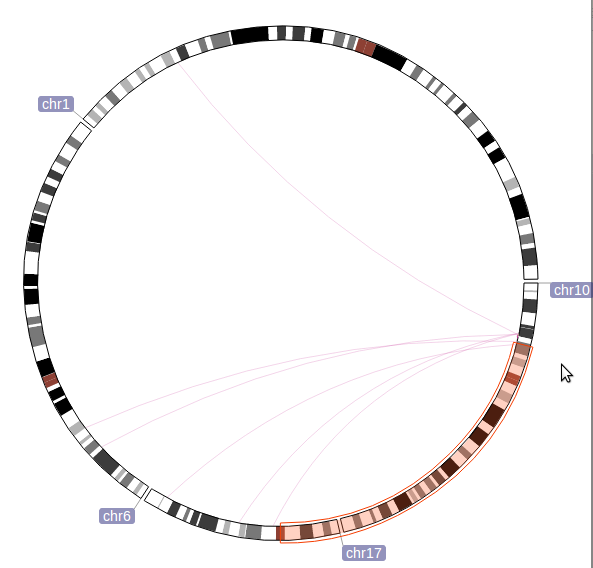 This code release features improved Circlet View, now a fully interactive, exploratory tool to visualize long-range chromatin interaction data. 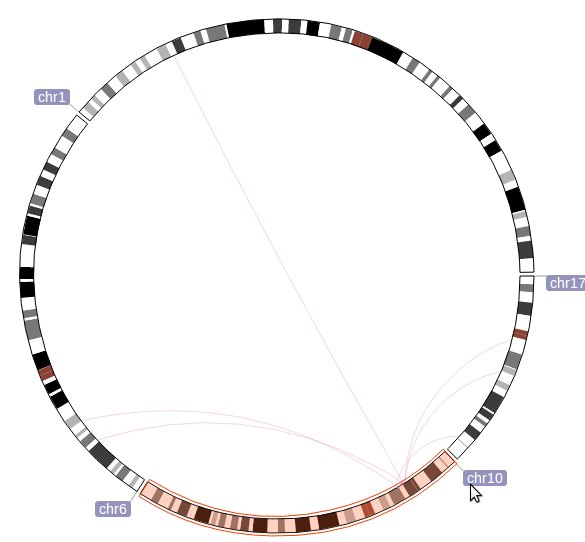 It achieves the awesome visual effect of the "Circos plot", yet it is so much easier to work with. You can download the source code from our server, or dropbox. 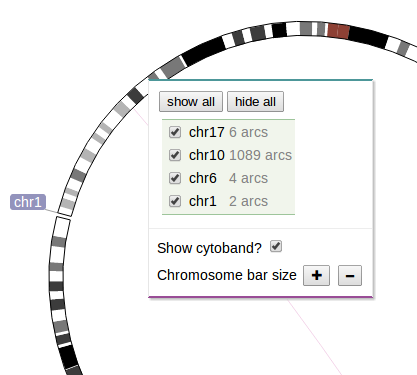 The Circlet View function was made as part of long-range chromatin interaction visualization functionality a while ago (as seen in version 7 code release). Yet we didn't describe it on our blog then, and now that the paper is about to come out, we thought we'd better give it a formal announcement. 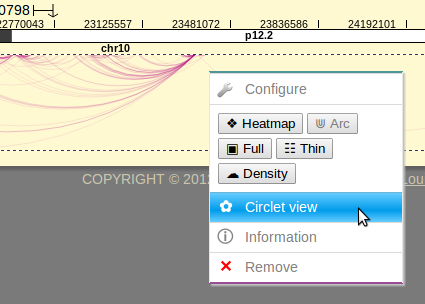 This function used to go under name "henge view", and one of our reviewers suggested we'd better change it... so there you go: Circlet. 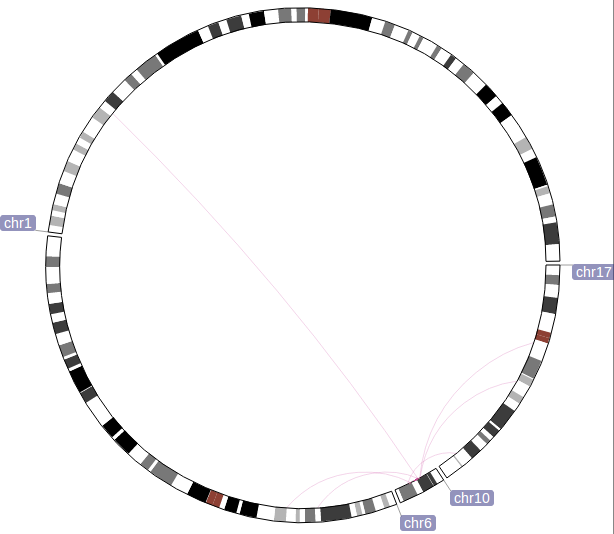 In this example more than one chromosomes are shown in the view (chr10, chr17, chr6, chr1). Each is identified by a blue button. The position of the button pinpoints the start of the chromosome, which means the clockwise direction is 5' to 3' on chromosome sequence. 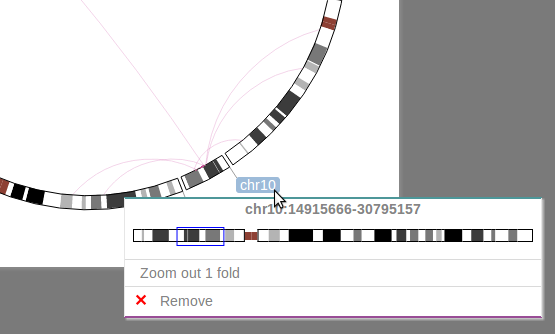 By right clicking on chromosome bar, you will see a list of chromosomes used in the view. This is primarily for adding a chromosome back after you got it removed. 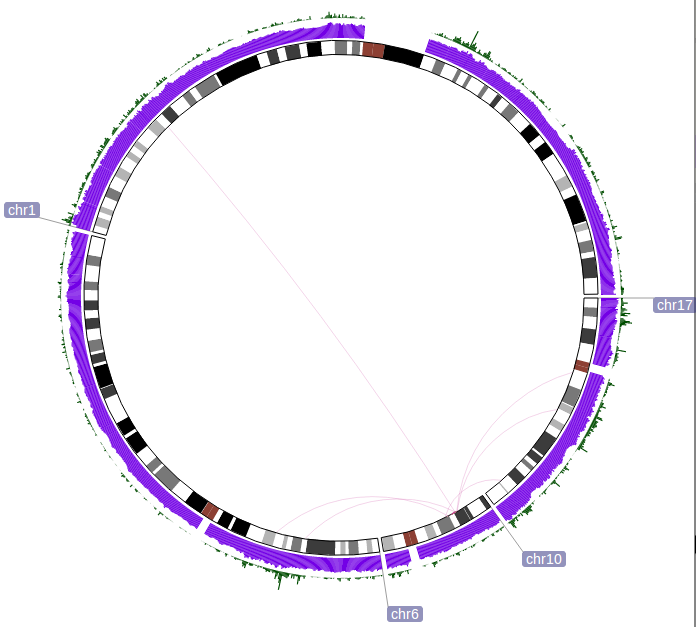 The gene track is displayed as density (green), and GC percent track is in blue. Remedy the limit of showing regional data only. 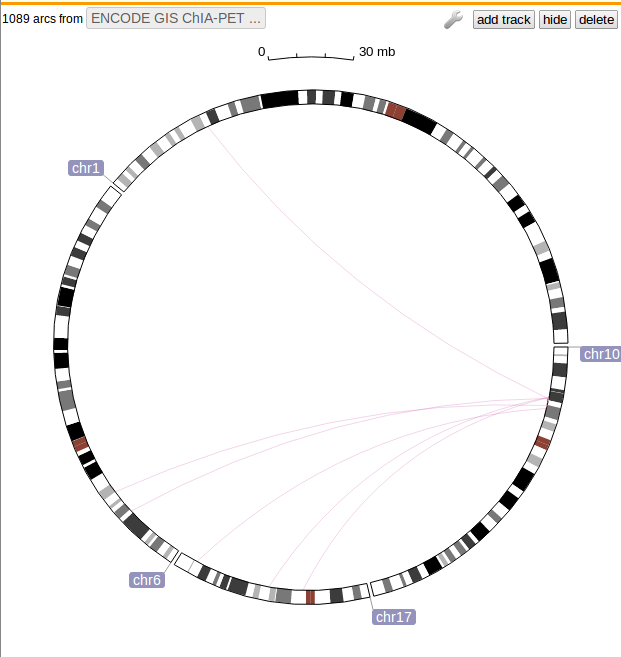 We will allow you to display Hi-C data on full chromosomes, or even the whole genome, as easy as above steps. 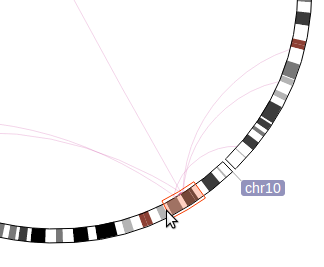 You will be able to overlay two tracks inside the same plot and show them as separate colors to compare. SVG output. Make it a plug-in web app. 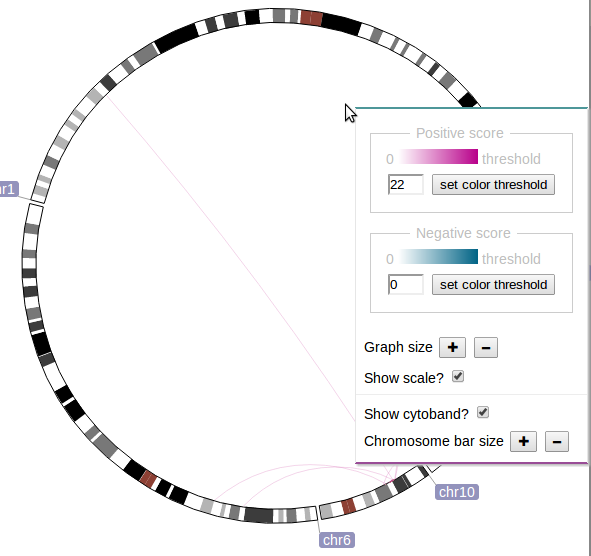 Think about displaying an interactive Circlet plot in your webpage, isn't that cool? This page was last modified on 10 April 2015, at 23:07.